It is my pleasure to welcome you to our UTM Department of Music website. 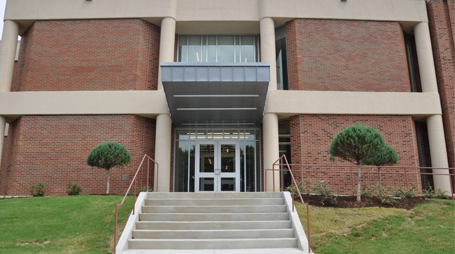 It is our goal to provide all needed tools and information here so that you may see how UTM provides the best return on your investment for undergraduate education in the entire state of Tennessee! All of you know quite well the invaluable lessons and life skills taught through participation in band and choir during middle school and high school. These include teamwork, time management, working well with others, and developing an outstanding work ethic to name a few. Here, at the University of Tennessee at Martin, we want to assure you that those life lessons will only continue and be expanding upon tenfold should you choose UTM as your university home. Whether you want to be a music major or just continue your passion for music while pursuing another career, we have a place for you. 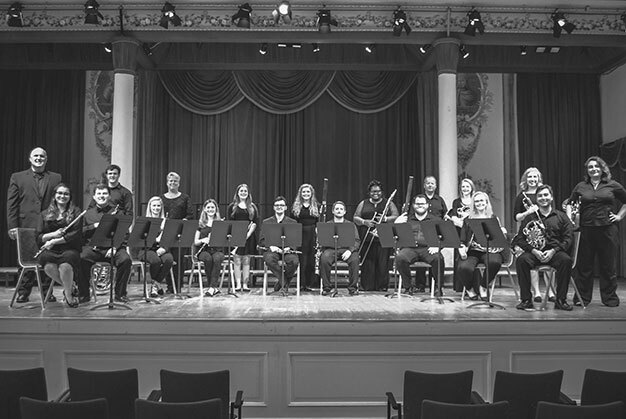 Our university provides opportunities to continue your love of music through our choirs and opera theater, athletic and concert bands, jazz band, chamber ensembles of all types, orchestra, and more. As you make the critical choice of where to continue your education at the next level in life, whether you want to major in music or not, UTM is an outstanding choice and a solid investment in your future! Please don't hesitate to contact me if I may be of any help to you and please come visit us soon! 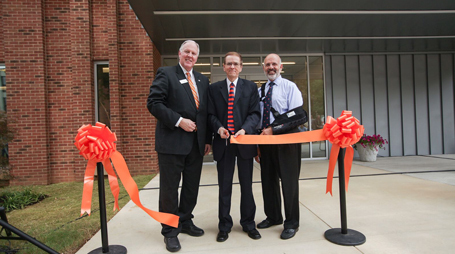 Opened in August of 2013, the renovated and expanded Fine Arts Building on the campus of the University of Tennessee at Martin serves as the home for the Departments of Music and Visual and Theater Arts. 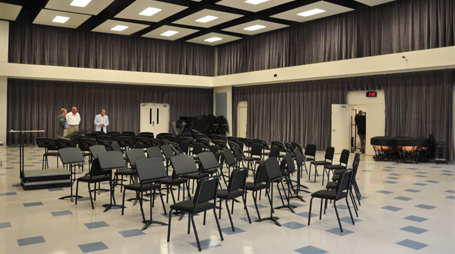 The 112,000 square foot facility was completed at a cost of $14 million and includes 16 classrooms, 24 studio rooms, 35 offices, 23 practice rooms, a music computer lab, choral/recital hall, band rehearsal hall, percussion rehearsal room, labs for graphic arts, ceramics, fabrics, and sculpture, a costume shop, scene shop and a state-of-the-art black-box theater. Plans are under way for phase two of the project, which will include a renovation of the Harriet Fulton Theatre and a new state of art large seat capacity performance hall. The mission of the Department of Music is to cultivate excellence in musical education, performance, and the liberal arts. 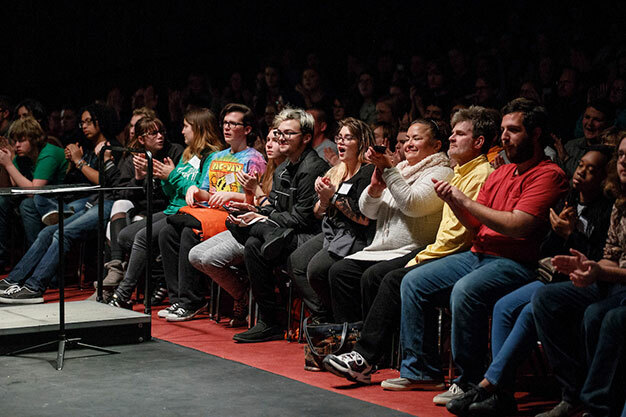 The department works to support and enhance the cultural and intellectual diversity of the community, while also serving as model performers, educators, and scholars. 1. 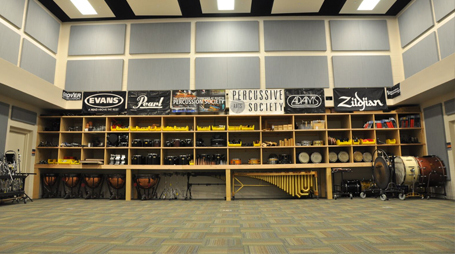 Demonstrate a conceptual understanding of musical components and processes. 2. Perform, analyze, create, and explain music. 3. Understand global musical cultures and historical periods. 4. 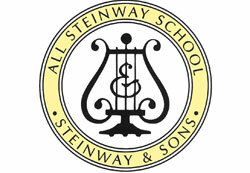 Integrate musical knowledge and skills into their chosen profession. 5. Exhibit the capability for entrepreneurial and independent work in music professions. 6. Demonstrate an understanding of and an ability to work with diverse populations. Produce graduates who will promote and advance the art of music. 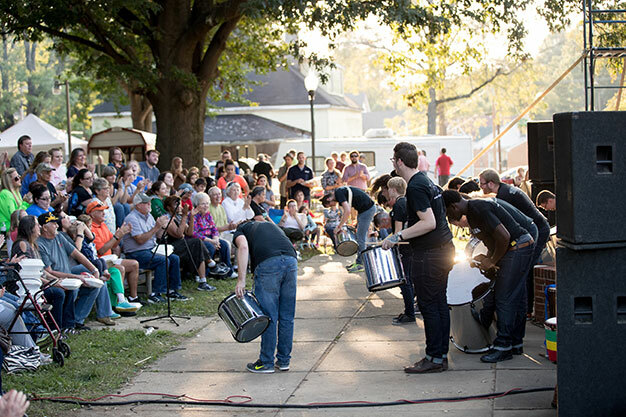 Enhance the quality of life on campus and in the region by presenting artistic musical events. 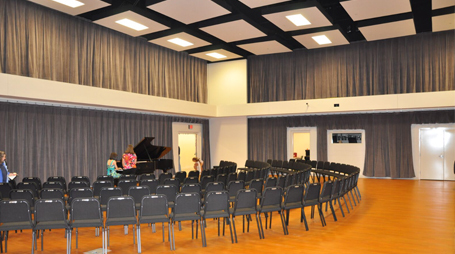 Support music educators and music programs through educational outreach. 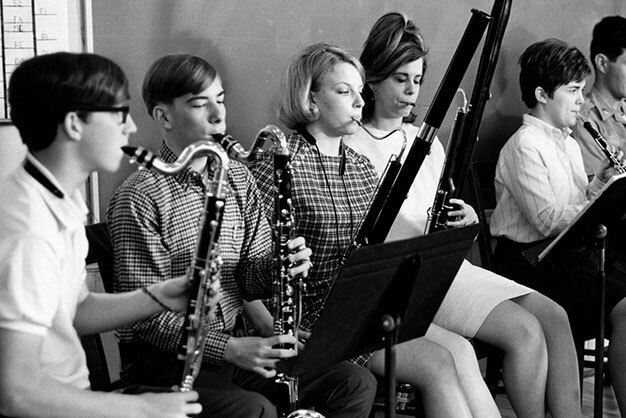 Cultivate relationships with musicians, arts organizations, and alumni. 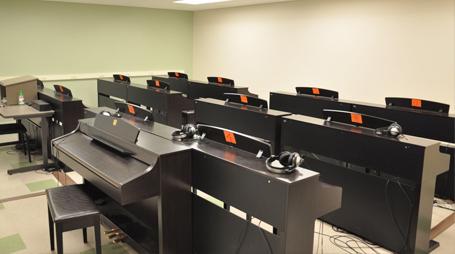 The student will perform music with accuracy and facility, interpreting it with expression, style and artistry. The student will analyze music and musical forms, both visually and aurally. 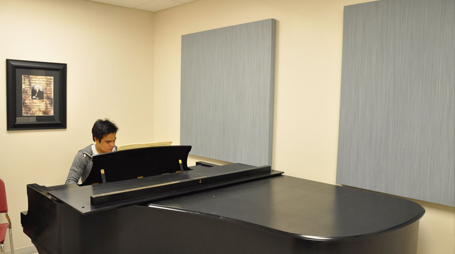 The student will create musical ideas utilizing skills such as arranging, composing, and/or improvising. 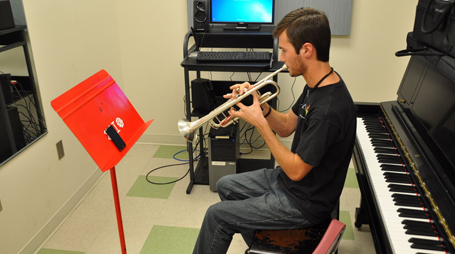 The student will employ musical terms, genres, styles, and concepts while connecting historical and cultural aspects of music. The student will explain concepts clearly, coherently and decisively, displaying extensive content knowledge and giving appropriate and well-timed feedback. The Chair is the chief executive officer of the department. The Chair's duties are outlined in the UTM Faculty Handbook. The Chair is responsible for determining which courses are to be offered and for assigning faculty load. The Chair will solicit the input of the faculty for teaching assignments prior to completion of the teaching schedule. Faculty assignments will be made based on department needs and faculty expertise. The Chair will convene a meeting in January for the purpose of scheduling events for the upcoming academic year. The Department Chair serves as an ex-officio non-voting member of all standing and other committees. The Chair is responsible for recommending salary increases for each faculty member, using the Merit Assessment Forms. Changes and amendments to these documents must be approved by the music faculty. The Department Chair is responsible for hiring non-tenure-track faculty, in accordance with the UTM Faculty Handbook. The annual performance review will factor in to decisions about continued employment. The Chair will convene a faculty retreat before the beginning of the fall semester for the purpose of planning for the new academic year. The full faculty will meet a minimum of two times per semester, as required by the UTM Faculty Handbook. The Chair must give notice of two business days for all meetings and distribute an agenda to the full faculty two business days in advance. Meetings will be conducted in accordance with Robert's Rules of Order. More than one-half of the voting faculty will constitute a quorum. The Chair will be counted when determining if a quorum is present. Minutes from each meeting will be distributed within a week of the meeting to all faculty and may be amended. Copies of the minutes will be kept in the department office. Full-time tenured and tenure-track faculty are eligible to vote on all motions and matters brought before the department. Full-time lecturers may vote on all issues with the exception of those dealing with personnel. Part-time, adjunct faculty, and faculty with visiting appointments are not eligible to vote. If a faculty member cannot attend a meeting, they may submit their vote on an issue or proposal to the Department Chair. Proposals must be vetted and approved by the appropriate committee prior to consideration by the faculty. The committee chair must distribute proposals electronically to the faculty on the Wednesday prior to the meeting during which that proposal will be discussed and voted on. Deliberation and voting must be conducted during a full faculty meeting. A simple majority vote with a quorum will decide all issues. The Chair has the option of voting in two circumstances: when the vote is by secret ballot or when his/her vote changes the outcome. If the Chair chooses to participate in a vote by secret ballot, then the Chair must do so at the same time as the rest of the faculty. adopt a strategic plan for the current academic year. Items on the strategic plan will be assigned to a committee or individual faculty member for implementation. Assigned faculty will give progress reports at departmental meetings and a final report at the last faculty meeting of the academic year. All tenured and tenure-track faculty are required to serve on one departmental standing committee. The Chair will propose committees at the last meeting and the faculty must vote to approve. Faculty members should email their committee preference to the Department Chair by mid-April. Committee chairs will be appointed by the Department Chair based on an interview in early April and will begin their term on August 1. Chairs will have a two-year term limit and can serve multiple terms. Chairs should expect to serve one additional year after their term expires to aid in transitioning to the new chair. All faculty members may submit agenda items to any standing committee chair for consideration by that committee in its next meeting. The Advisory Committee manages all departmental policy documents, including the Department of Music Bylaws. In addition, the committee may discuss and make recommendations for procedural issues that involve both students and faculty. submit assessment data to the Department Chair. The Curriculum and Assessment Committee works in conjunction with the College of Humanities and Fine Arts Curriculum Committee. The chair of the Curriculum and Assessment Committee traditionally serves on the College of Humanities and Fine Arts Curriculum Committee; term limits may apply for that position. Additionally, a member of the Curriculum and Assessment Committee will serve on the College of Humanities and Fine Arts Degree Appeals Committee. The Executive Committee consists of the Department Chair, standing committee chairs, and the vocal and instrumental area chairs. The committee will provide feedback and advice to the Department Chair. Other non-standing committees may be established to address the needs of the department. The membership of search committees and ad-hoc committees is determined by the faculty. Each committee will elect a chair at its first meeting. making recommendations for an appointment. A search committee must have at least three faculty members but can include more. Membership is limited to tenured and tenure-track faculty. Traditionally, members of the committee have expertise in the area of the new position or vacancy. The search committee must be approved by the faculty. Additional search committee procedures are outlined in the UTM Faculty Handbook. Section 5.1 of the Department of Music Bylaws addresses the make-up and function of this committee. Additional procedures and policies in regard to tenure and promotion are outlined in the UTM Faculty Handbook. The Scholarship Committee, comprised of the Department Chair, the Director of Bands, and Director of Choirs, is responsible for the consideration and distribution of scholarships. The committee will consult with applied faculty regarding the needs of the department. Ad-hoc committees may be formed to resolve immediate problems or address particular departmental needs. An ad-hoc committee makes recommendations to the chair and/or the full faculty. Elections for faculty senators will be conducted in the spring semester or as required by a vacancy. To be eligible to serve on the Faculty Senate, a faculty member must hold a full-time appointment with academic rank and have completed at least three of years service at UTM in a tenure-track position prior to the beginning of the term of office. All full-time faculty are entitled to vote, even if ineligible to serve. The representative for the Senate Library Committee will be selected at the annual planning meeting. 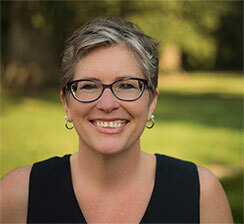 As stipulated in the college bylaws, one tenured faculty member will serve on each college Tenure and Promotion Committee, as selected by the Dean from nominations by the Department Chair. 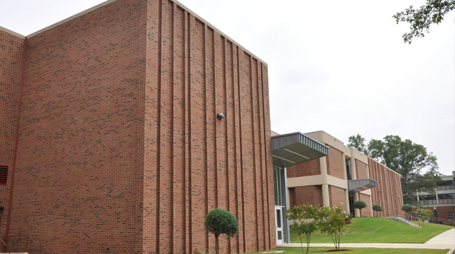 The representative for the College of Humanities and Fine Arts Curriculum Committee will be selected by the Department of Music Curriculum Committee at its first meeting. The representative for the College Degrees Committee will be selected by the Department of Music Curriculum Committee at its first meeting. The UTM Faculty Handbook requires the Department Chair to complete an annual performance-and-planning review of all faculty. The review will be conducted in accordance with the Guidelines for Satisfactory Performance Evaluation and Merit Assessment Forms approved by the faculty of the Department of Music. Changes and amendments to these documents must be approved by the faculty. goals for the upcoming academic year in teaching, service, and creative/research activity. Merit Assessment Forms must be submitted for consideration for merit pay. For 2018-19, faculty will be assessed using both the Merit Assessment Forms and the new rubrics. At the conclusion of the performance-and-planning review, each faculty member will choose which method is used to figure the number determining merit pay. For tenured and tenure-track faculty using Merit Assessment Forms, teaching is worth 50% and the other two areas are each worth 25%. Tenured and tenure-track faculty using rubrics agree upon weights in the previous year’s performance-and-planning review. Teaching will comprise 50%-65% of the final score, scholarship 20%-35%, and service 15%-25%. The agreed-upon weights may only be revised under exceptional circumstances and with approval of the Department Chair. Non-tenure track faculty using Merit Assessment Forms receive a written summary. For non-tenure track faculty using rubrics, the Chair will specify the weights of teaching, research, and service in the appointment letter; for subsequent years, the Chair may adjust these weights in the annual performance-and-planning review. 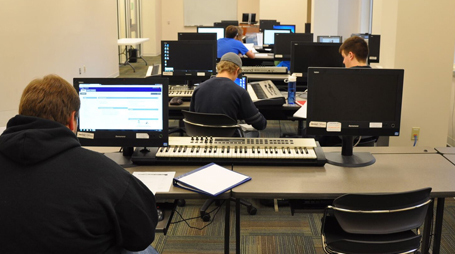 To promote excellence in teaching in the Department of Music and provide documentation for assessment, all faculty who teach will submit to an annual review of teaching to be implemented by the Department Chair in conjunction with tenured faculty. The process will include the review of a teaching portfolio and yearly classroom observation by the Department Chair until the Pre-Tenure Review. The enhanced tenure-track review will be conducted in the spring of the third year, in accordance with the Faculty Handbook and college bylaws. The periodic post-tenure performance review will be conducted every five years, in accordance with the Faculty Handbook and college bylaws. received two “Needs Improvement” ratings in over the span of four performance-and-planning reviews. Criteria for Tenure and Promotion are provided in the UTM Faculty Handbook and college bylaws. Additional criteria are listed on the Merit Assessment Forms and rubrics. The tenure and promotion process is outlined in the UTM Faculty Handbook, including procedures for applying and materials that must be submitted in the dossier. The tenure process will include external reviews and a peer teaching review, to be conducted in a method approved by the faculty. The departmental Tenure and Promotion Committee is comprised of all tenured faculty in the Department of Music. The charge of the departmental Tenure and Promotion Committee is to approve advisory committees for tenure and promotion and select advisory committee chairs to oversee each application. The departmental Tenure and Promotion Committee will elect a chair at the beginning of the academic year to facilitate the selection of advisory committee chairs, schedule meetings for the committee and conduct the vote on each application. The chair of the departmental Tenure and Promotion Committee will give the committee notice of two business days before a discussion and vote to approve a tenure or promotion application. A simple majority is needed for a positive recommendation; in the event of a tie, the committee will make a positive recommendation. The vote to approve a tenure or promotion application must be taken by secret ballot. The departmental administrative assistant will create and collect ballots for all tenure and promotion votes; the votes will be tallied in the presence of an additional staff member. The written recommendation must be approved by the advisory committee. Committee members must be given the opportunity to offer amendments to the document. Advisory committees for tenure will include all tenured faculty. Advisory committees considering promotions to the rank of associate professor will include all tenured associate and full professors. Advisory committees considering promotions to the rank of full professor will include all tenured full professors. The Department Chair will not serve as a member of any advisory committee or participate in deliberations. Advisory committees for tenure and promotion must have a minimum of three members. If there is an insufficient number of tenured faculty members from within the department, one or more members may be selected from another department, preferably within the College of Humanities and Fine Arts. A chair will be elected for each advisory committee. Advisory committees must be approved by the Vice Chancellor for Academic Affairs. Discuss the application in detail. Assist the advisory committee chair in completing the written recommendation. Notify the candidate in writing of his/her right to appear before the committee and inspect all of the personnel files and materials to be considered by the committee. Address the candidate’s questions or concerns as (s)he prepares the application. Distribute work assignments among the committee members. Ensure that a meaningful discussion of the application occurs. With the assistance of the advisory committee, compile a preliminary draft of the written recommendation, ask for amendments to that document and call for a vote to approve the final draft. Submit the written recommendation to the Department Chair according to the Tenure and Promotion Calendar set by the Division of Academic Affairs. Notify the applicant in writing of the committee’s decision on the day the recommendation is due to the chair. The vote to approve each application must be conducted at least one week in advance of the deadline. An initial draft of the written recommendation, including any concerns about the application, must be completed and distributed to the committee by the Monday prior to the deadline; committee members will be given 48 hours to submit revisions and/or a dissenting report. The advisory committee chair will submit a revised version of the written recommendation to the committee and ask for any additional amendments before taking a final vote to approve the document. Advisory committee chairs will notify applicants in writing of committee decisions on the day the recommendation is due to the chair. If there is a dissenting report, it will be provided to the candidate at this time. Any requested changes to the Tenure and Promotion Calendar set out by the Division of Academic Affairs must be approved by the Department Chair and the Vice Chancellor for Academic Affairs. Decisions regarding the termination of non-tenured faculty will be made by the Department Chair, in accordance with the UTM Faculty Handbook. Termination of tenured faculty will occur as outlined in the Faculty Handbook. The voting procedure will be the same as to approve an application for tenure or promotion. If any provision of these bylaws is inconsistent with the UTM Faculty Handbook, then the UTM Faculty Handbook will take precedence; if inconsistent with the bylaws for the College of Humanities and Fine Arts, the College bylaws will take precedence. If any provision of these bylaws is inconsistent with or unclear in regard to the College of Humanities and Fine Arts, The University of Tennessee at Martin, or the University of Tennessee system, that provision will be interpreted in a manner that is most favorable to the individual faculty member. Proposed amendments to these bylaws must be brought to the full faculty by the Advisory Committee, which will accept suggestions from any faculty member. Proposed changes must be distributed electronically to the full faculty at least 10 business days prior to a vote. The bylaws may be amended by a simple majority vote at any departmental meeting; faculty members who are unable to attend may submit their vote on any amendment(s) to the Chair in advance of the meeting. Amendments must be approved by the Dean of the College of Humanities and Fine Arts and the Vice Chancellor for Academic Affairs.